While they were once a mystery, we now know quasars are driven by black holes in the center of galaxies, and are part of a larger class of objects known as active galactic nuclei, or AGNs. What makes quasars distinctive is that they are very bright, and their light is highly redshifted. This latter property means that they are also very far away. Because of their great distance, the light from quasars began their journey billions of years ago. This means the study of quasars allow us to understand the earliest examples of active black holes. The great distance of quasars also poses a challenge, because it is difficult to measure the properties of an object billions of light years away. But sometimes a bit of luck will allow astronomers to make some good observations. Such is the case of a recent paper in Nature which measures the rotation of a quasar’s black hole. 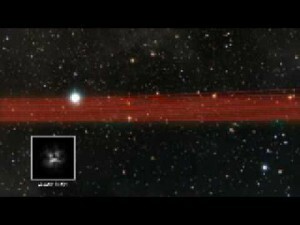 The lensed x-ray light from the quasar. Circles indicate regions used in the analysis. Credit: R. C. Reis, et al. The particular quasar in question has a redshift of z = 0.658, which means its light left the quasar about six billion years ago. It also happens to be behind a much closer galaxy from our viewpoint. You might think that might make observing the quasar worse, but in away it is actually a good thing. 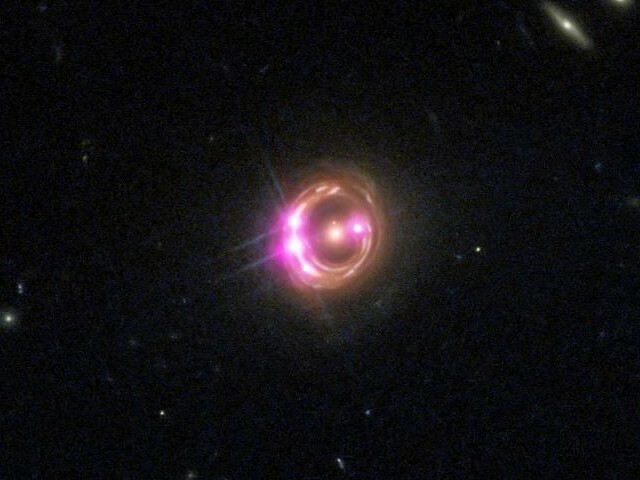 The mass of the close galaxy acts as a gravitational lens, bending the light of the quasar a bit, and focusing it in our direction. This means we actually see more light from the quasar than we would if the closer galaxy wasn’t there. Of course the galaxy also distorts the light coming from the quasars, so the team had to reconstruct the image of the quasar using the gravitationally lensed light. Doing that, they then had a strong enough x-ray source from the quasar to analyze its rotation. This is done by looking at light reflected off its accretion disk. The region around the supermassive black hole of the quasar generates intense x-rays, and some of it reflects off material in the accretion disk. The motion of the accretion disk around the black hole means that some of the reflected light is redshifted more than the average for the quasar, and some less. By measuring this difference it is possible to measure the rotation of the accretion disk, which in turn allows us to determine the rotation of the black hole. The rotation of a black hole is often given as a parameter known as “a”. This parameter can have a value between 0 (no rotation) and 1 (maximum possible rotation). Sometimes in the popular press it is stated that the maximum rotation rate is the speed of light, but that isn’t quite how things work. So we’ll stick with “a” as a measure of its rotation. 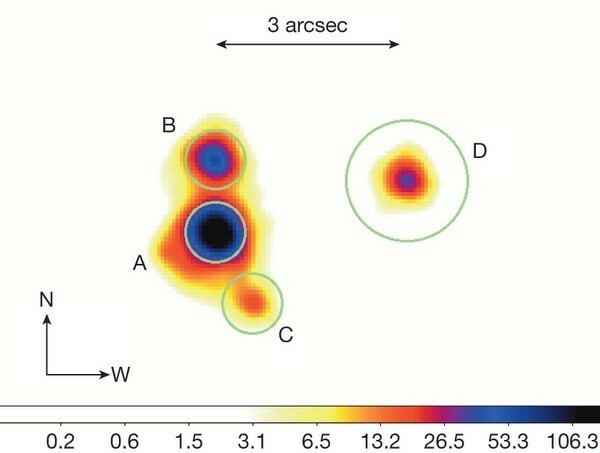 What the authors found was that this particular quasar had a rotation of at least a = 0.66, and very possibly as high as a = 0.87. This is a very high rotation rate, and it likely means this particular black hole formed as a merger between two smaller black holes. What makes this interesting is that it hints at early supermassive black holes forming by mergers. By the time the universe was 7 billion years old, two supermassive black holes had formed, then merged to produce this fast-rotating supermassive black hole. Of course this is only one example, so we don’t know if such fast-rotating quasars are common or exceptional. What we do know is that even early black holes can rotate very fast indeed.